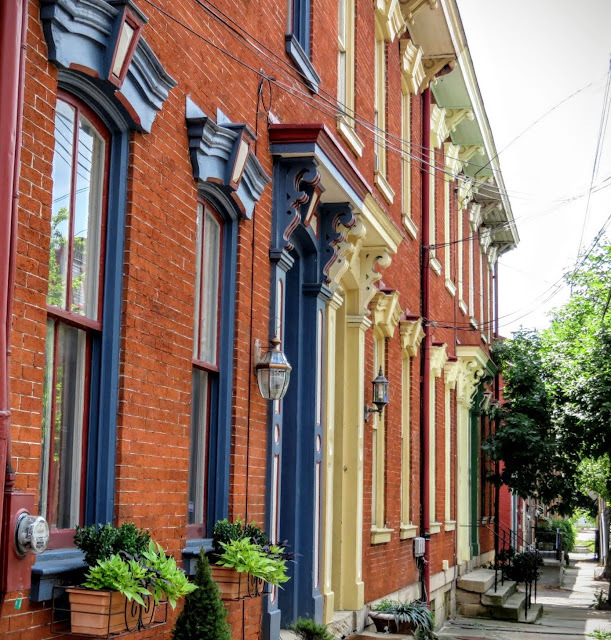 The Mexican War Streets in Pittsburgh is the perfect neighborhood for a photowalk. 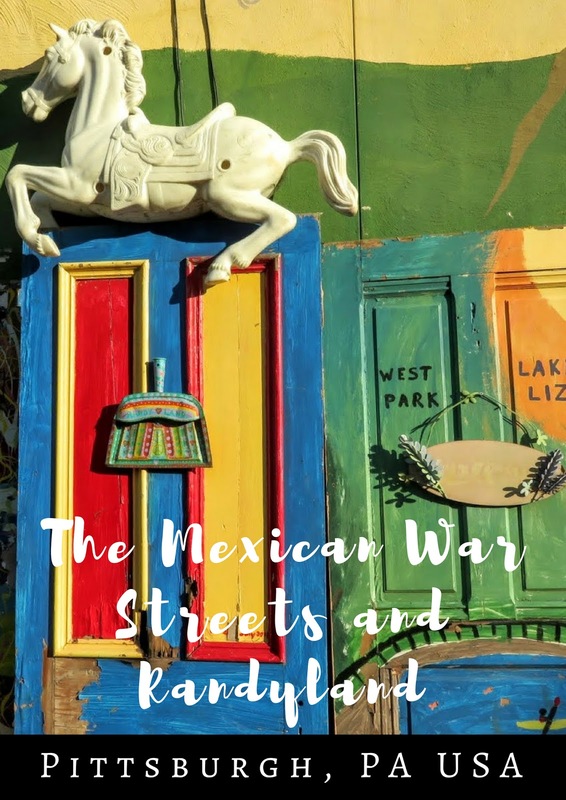 On my last trip, a friend of mine who was spending the summer in Pittsburgh organized a small group to visit the Mexican War Streets. 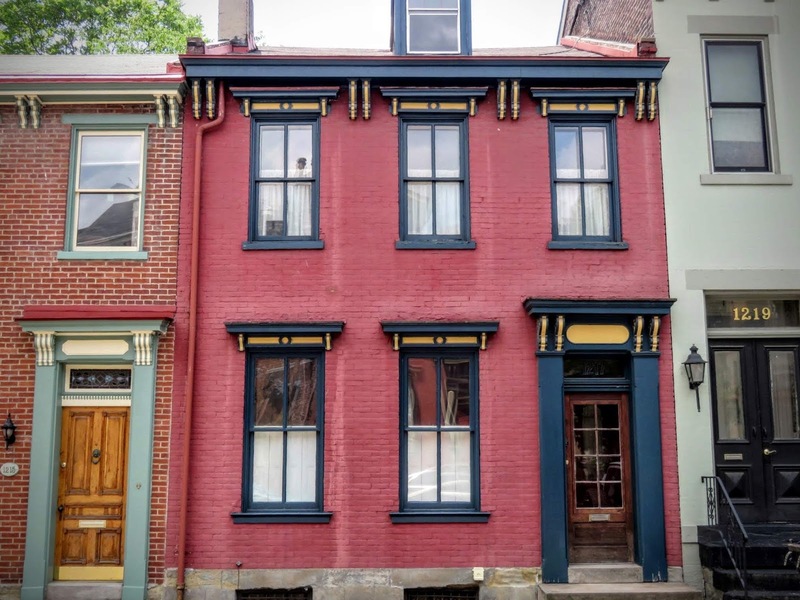 The Mexican War Streets comprise a historic district on the central northside of Pittsburgh and got their name because most of the neighborhood was built around 1848, when the Mexican-American war was raging. The Victorian-era row homes give the Mexican War Streets a ton of character and offer an incredible number of photo-ops including the quirky and iconic Randyland. 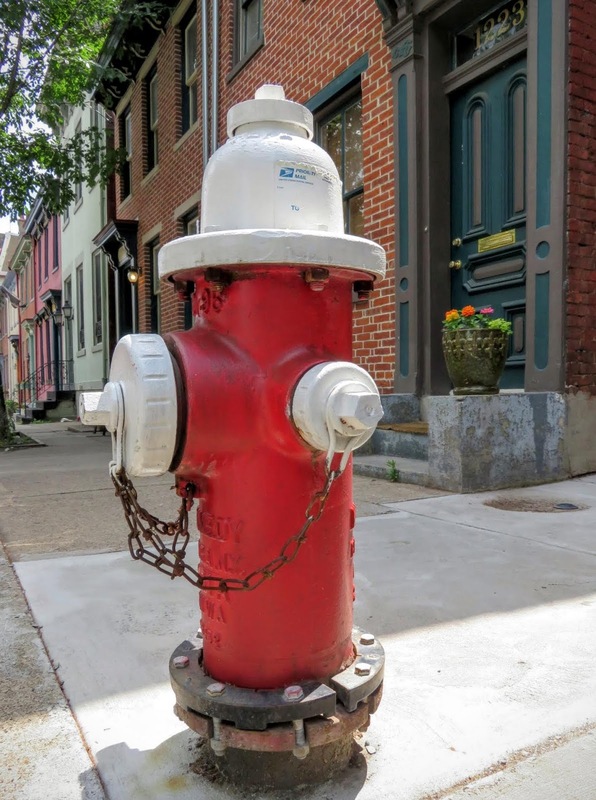 We couldn't wait to get started on our photowalk of Pittsburgh! 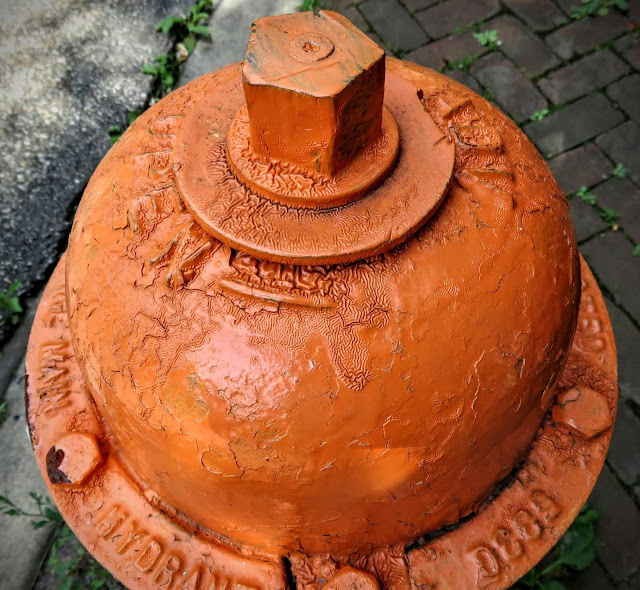 The first thing that impressed me about the Mexican War Streets neighborhood of Pittsburgh was the colorful fire hydrants. 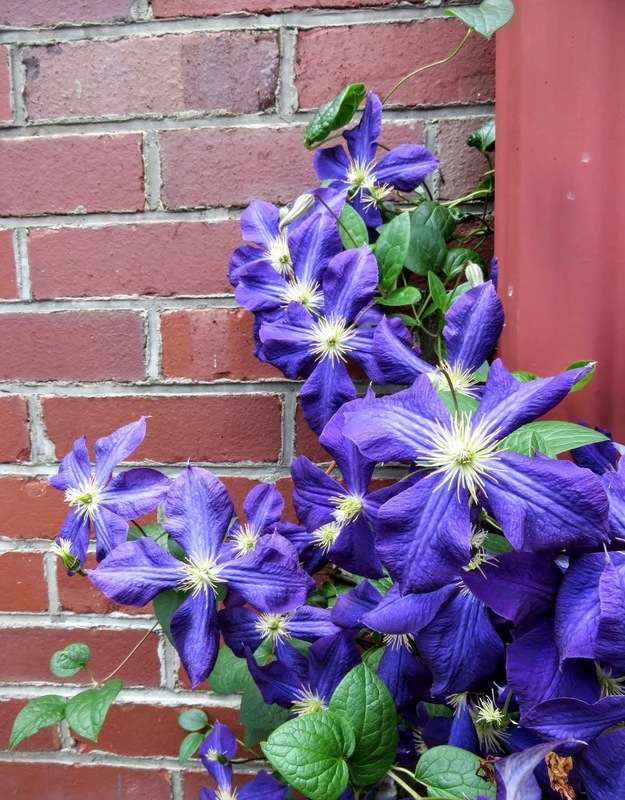 Everywhere I turned, there was a splash of color on the sidewalk. 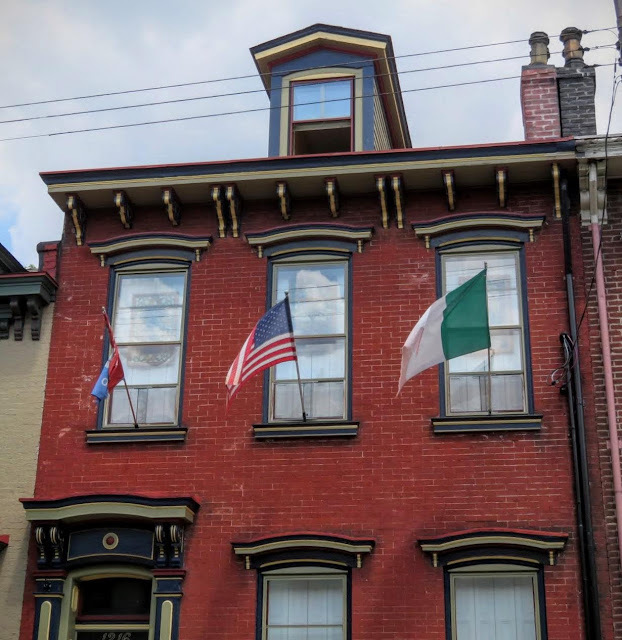 I felt a bit homesick visiting Pittsburgh's Mexican War Streets when I saw the Irish flag flying in front of a few Victorian facades. 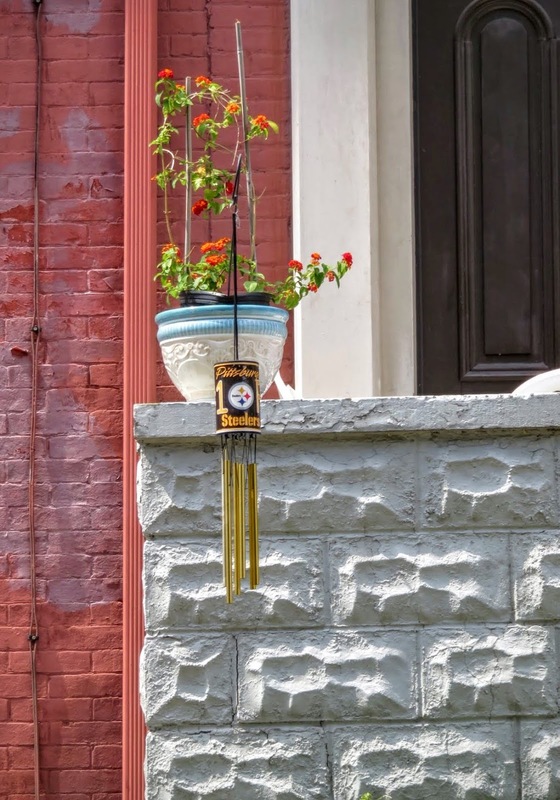 The Mexican War Streets are known for their ethnically diverse residents which is one of the reasons the neighborhood is so interesting to visit and so photogenic. Fancy facades abound around Pittsburgh's Mexican War Streets. 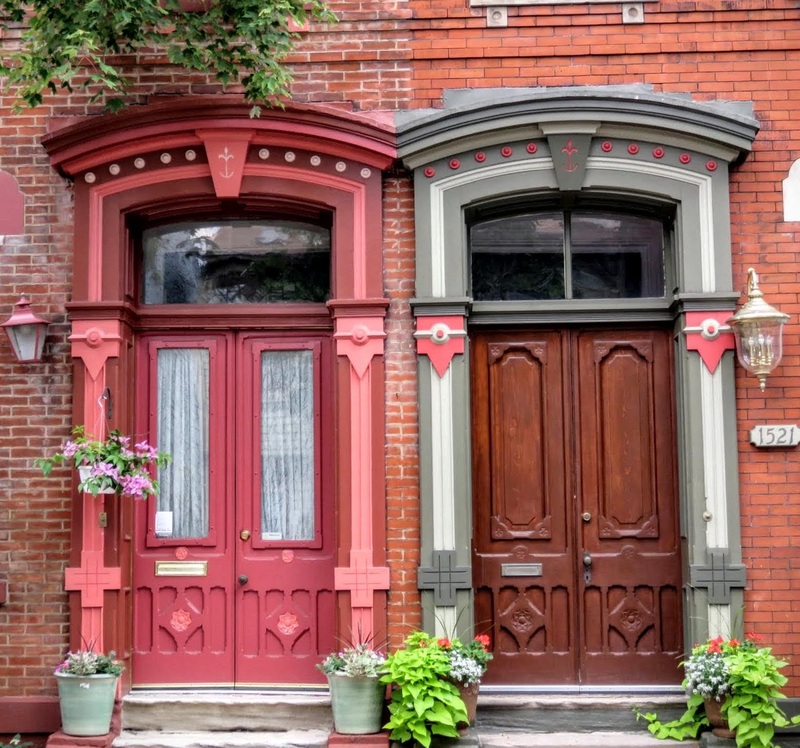 I love how each home in the neighborhood has its own personality. The doors and windows of the Mexican War Streets neighborhood are often painted in bright, outrageous colors. Love it! We've already seen pops of color everywhere around Pittsburgh's Mexican War Streets. 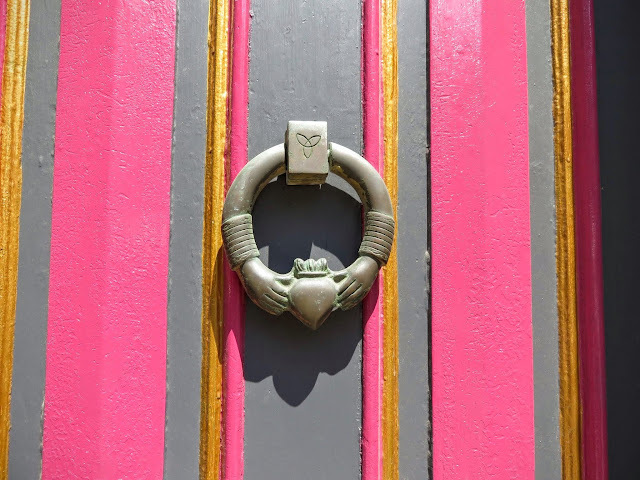 The bright colors are one of the reasons that this historic Pittsburgh neighborhood is so photogenic and fantastic for a photowalk. 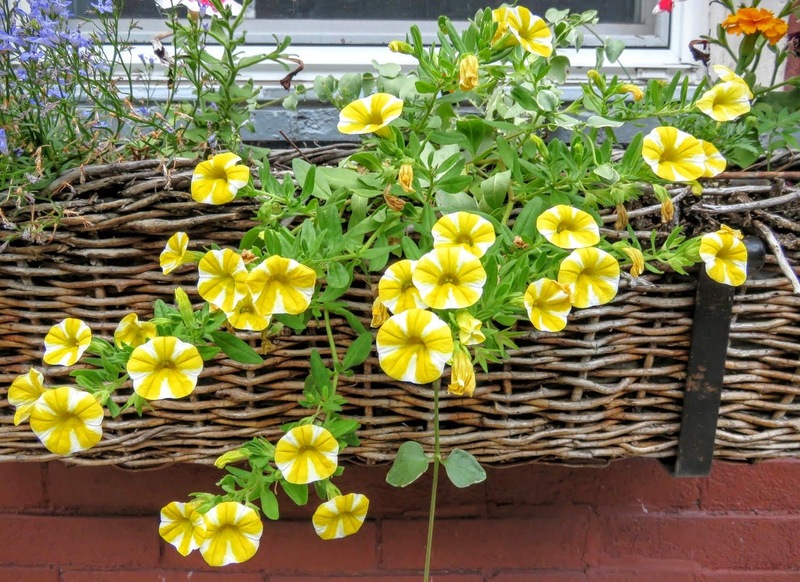 We visited The Mexican War Streets in June and had the added benefit of riotous flower boxes adding even more visual interest. 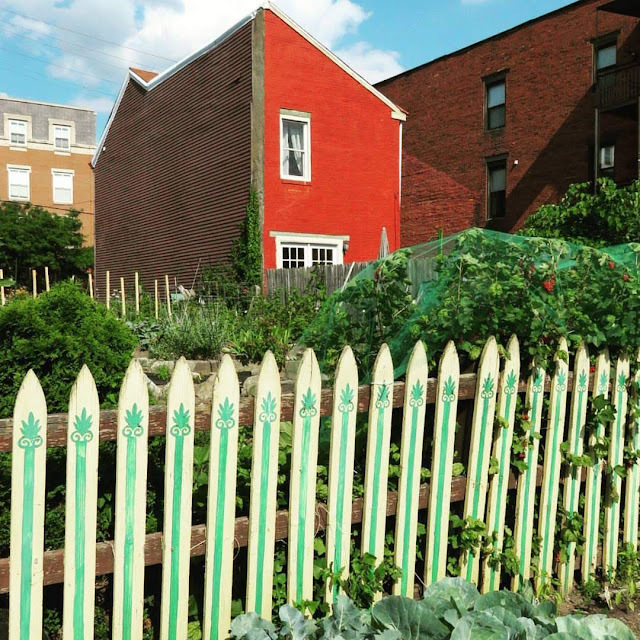 The Pittsburgh Mexican War Streets also feature a charming community garden complete with a white picket fence embellished with a bit of color. ...to stone gargoyles guarding the entrance to homes around the Mexican War Streets. I soon turned my camera to ground level. 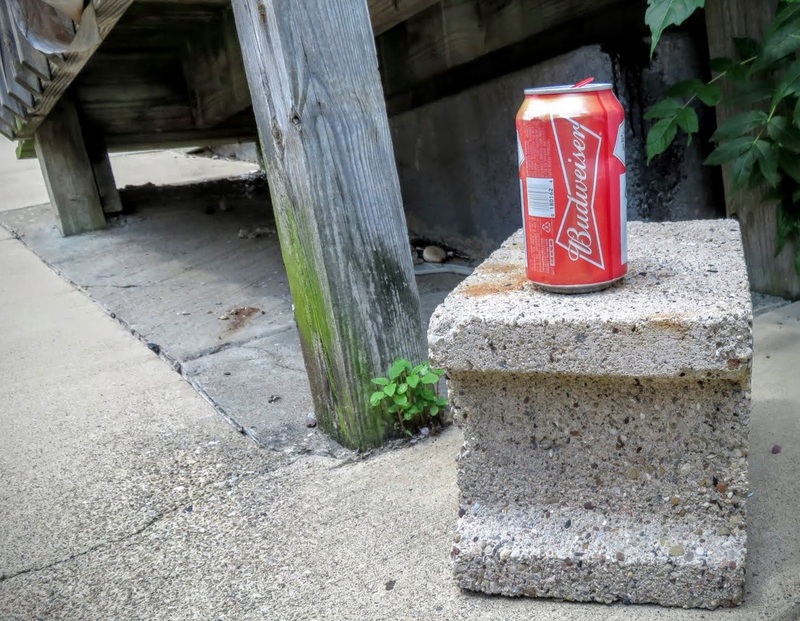 I loved this beer can 'up on blocks'. Even the utility manhole covers had character. 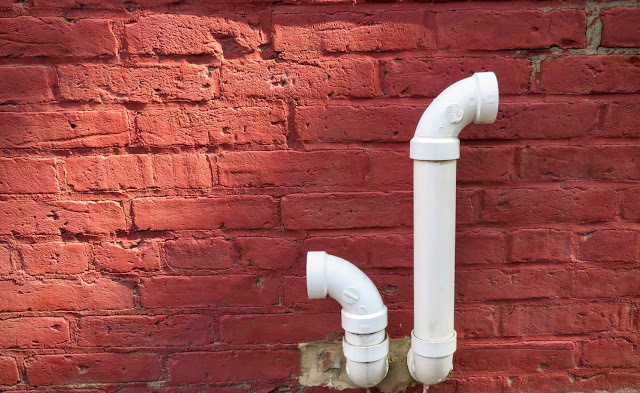 This set of white pipes leading to nowhere against the deep red wall caught my attention. Pittsburgh's Mexican War Streets are so photogenic, even at ground level! We visited on a warm June day in Pittsburgh so we took the opportunity to get out of the sun and visit the Mattress Factory, Pittsburgh's modern art museum located in the Mexican War Streets neighborhood. The Mattress Factory was hosting a community open house when we visited and as a result I managed to get myself a glow in the dark temporary tattoo and got to screen print a tote bag to take home with me (all for free!). 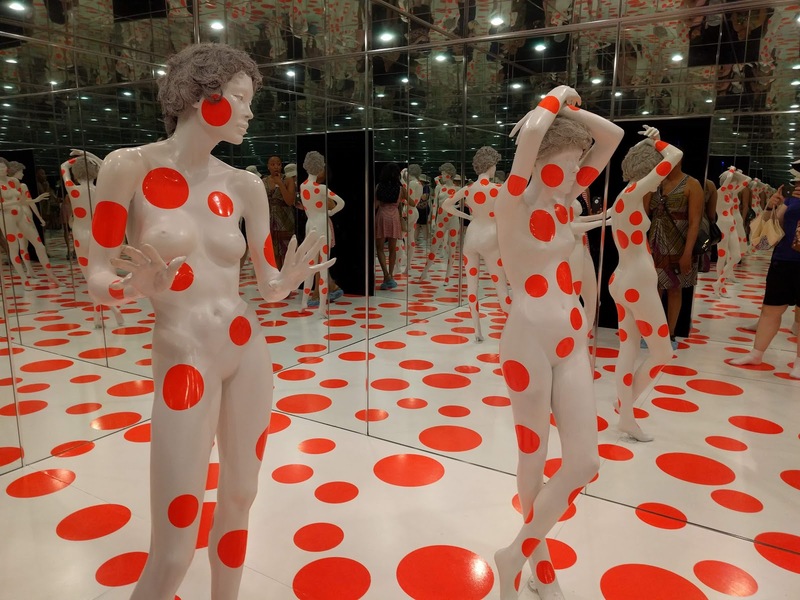 The highlight of the Mattress Factory for me though was what I like to call the Disco Room. To explore this modern art exhibit, you take your shoes off and then enter a world filled with mirrors and neon circles. Click on the photo below to explore a 360 panorama. Cities of Asylum provide refuge to writers' who are at risk of violence or being killed in their home country due to the controversial nature of their work. For example, Salman Rushdie was forced into hiding after a fatwa was issued against him in the wake of the publication of The Satanic Verses. The City of Asylum supports endangered writers in exile for up to 2 years. 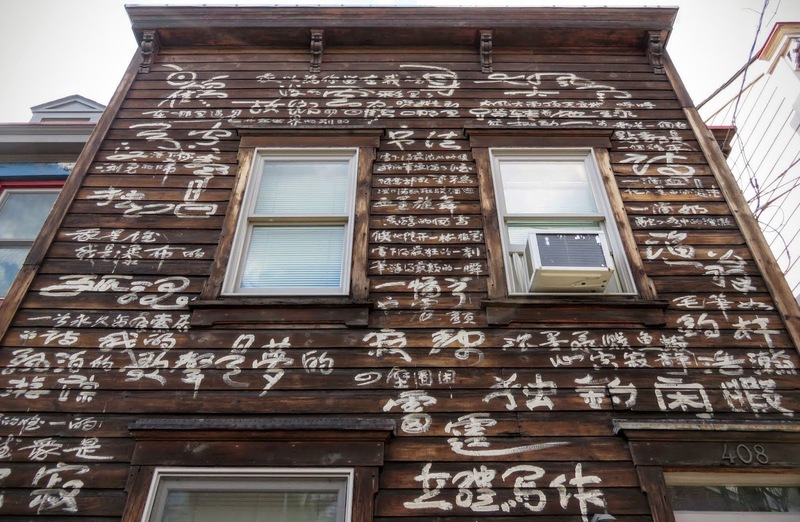 The Cities of Asylum in Pittsburgh and other locations around the world exist to protect freedom of speech and publication but also provide a safe place for exiled writers. 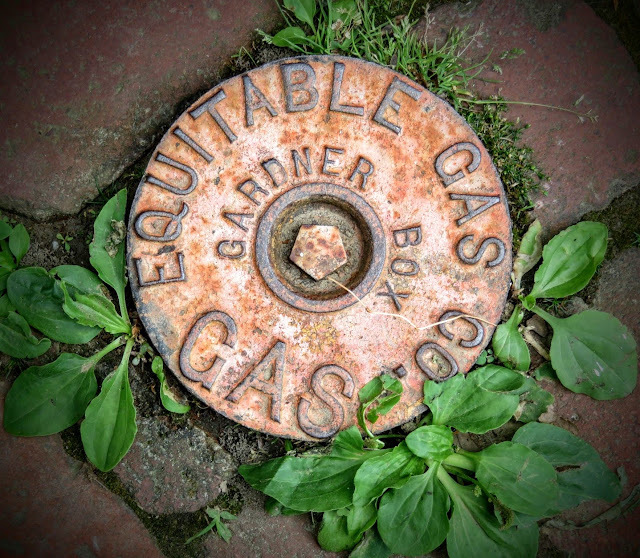 Pittsburgh's City of Asylum House Publications are particularly fascinating. 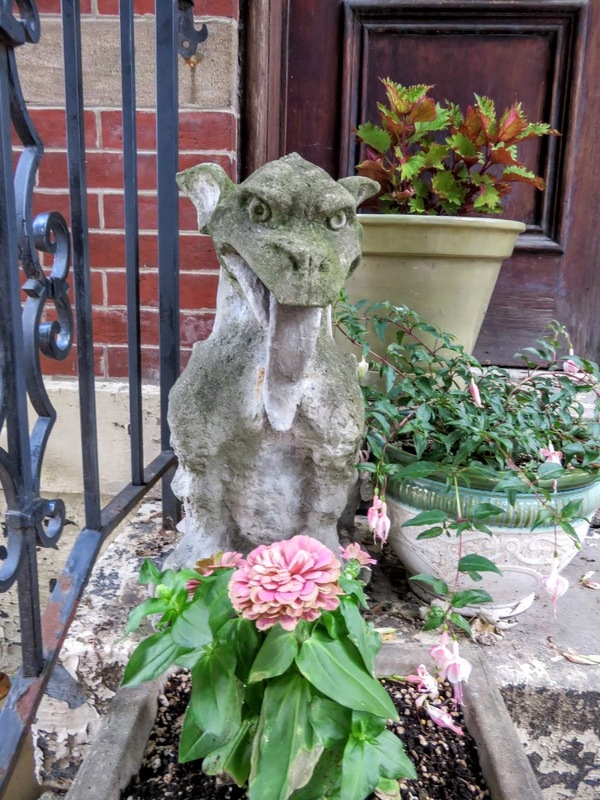 These works of art on Sampsonia Way celebrate the authors in residence and are another outlet for creative expression that would overwhelming be repressed in the authors' home countries. 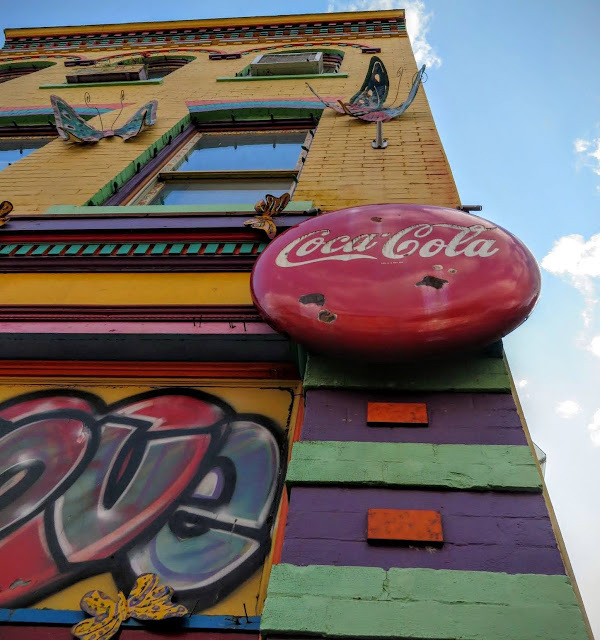 Randyland, the final stop on our photowalk through Pittsburgh's Mexican War Streets, absolutely made me smile from ear to ear. Picture a riotously colored building covered in items of flair from top to bottom. 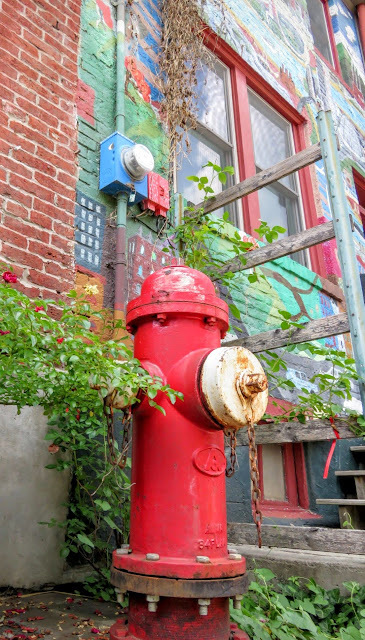 That's what greets you when you round the corner and see Randyland for the first time. After admiring the facade, we followed the fence around to the side of the house and lo and behold, Randyland was open on this fine evening! We cautiously poked our heads into the yard and nodded to the bright red knight guarding the entrance. We were soon welcomed to Randyland by Randy himself. 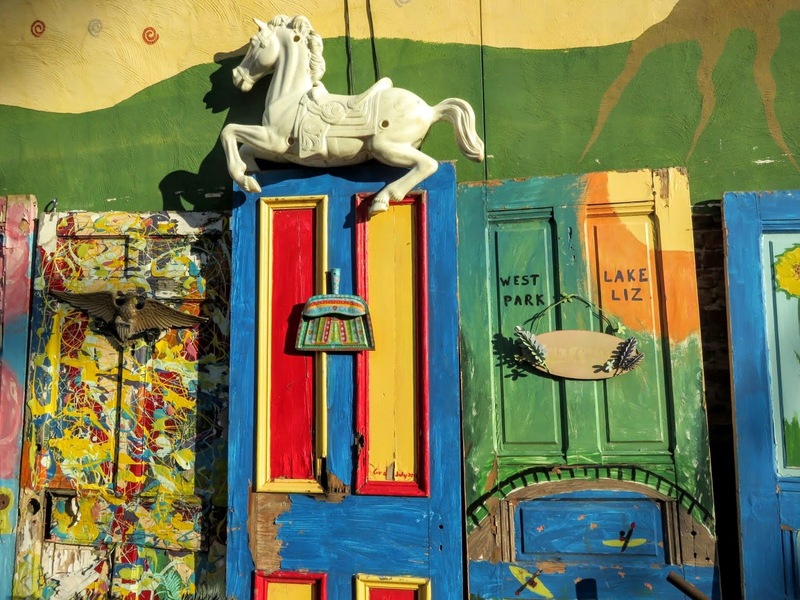 The self-proclaimed happiest man alive ushered us in and gave us a tour of Randyland while espousing on his life philosophy. 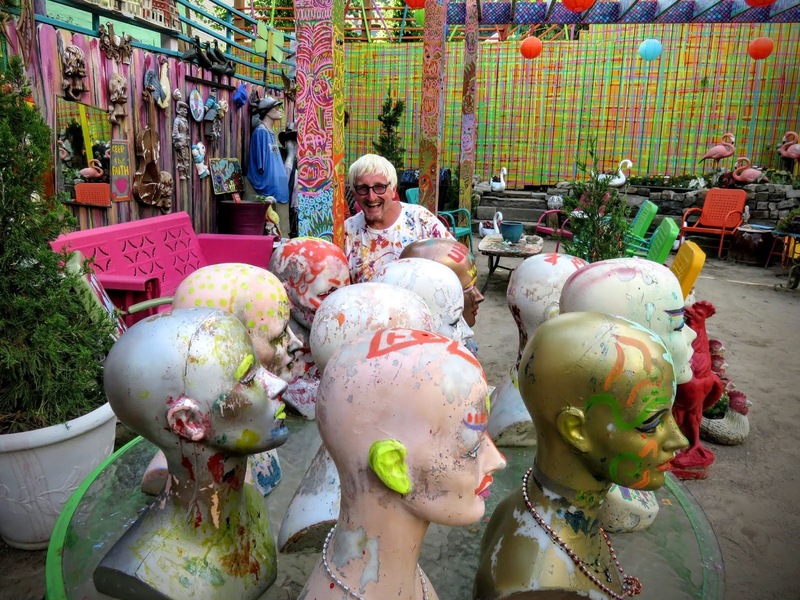 Randy has collected and painted everything at Randyland. 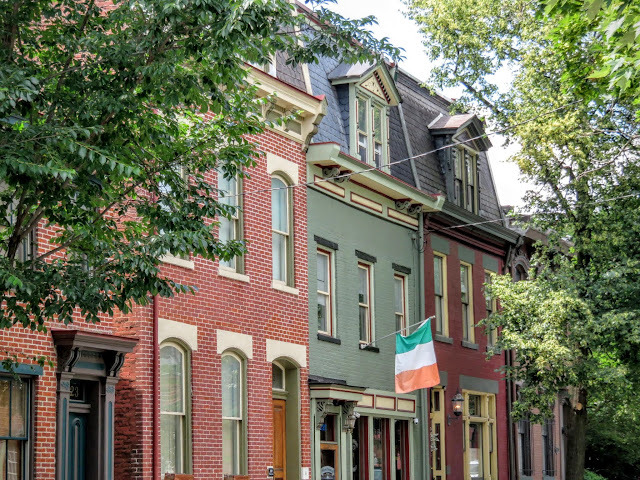 It has taken Randy 30 years to build this mecca of happiness in the heart of Pittsburgh's Mexican War Streets. Randy's happiness is indeed infectious. I guarantee that you'll leave Randyland happier than when you arrived and with a big smile on your face. 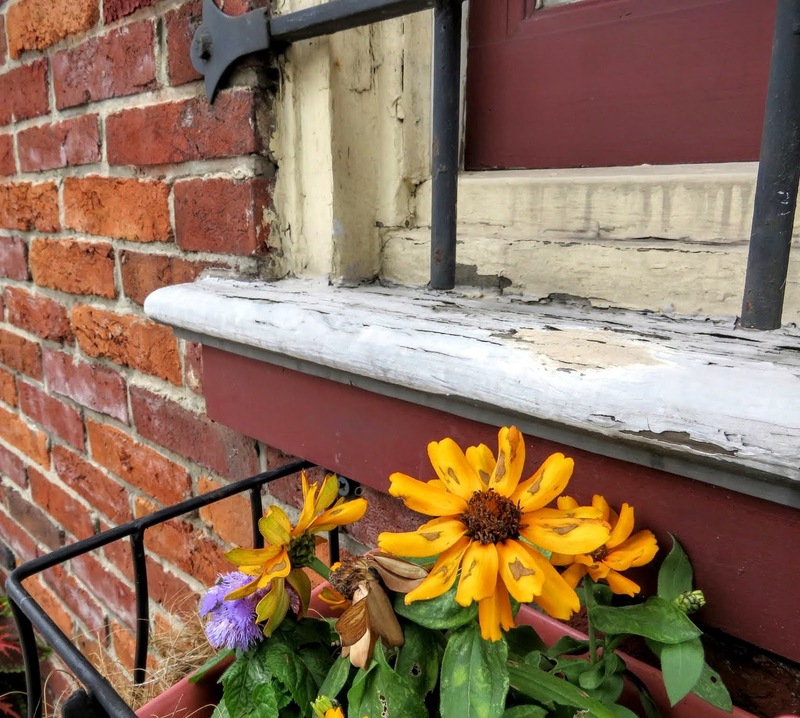 There you have it, a photo essay from our walk through the Mexican War Streets neighborhood of Pittsburgh. 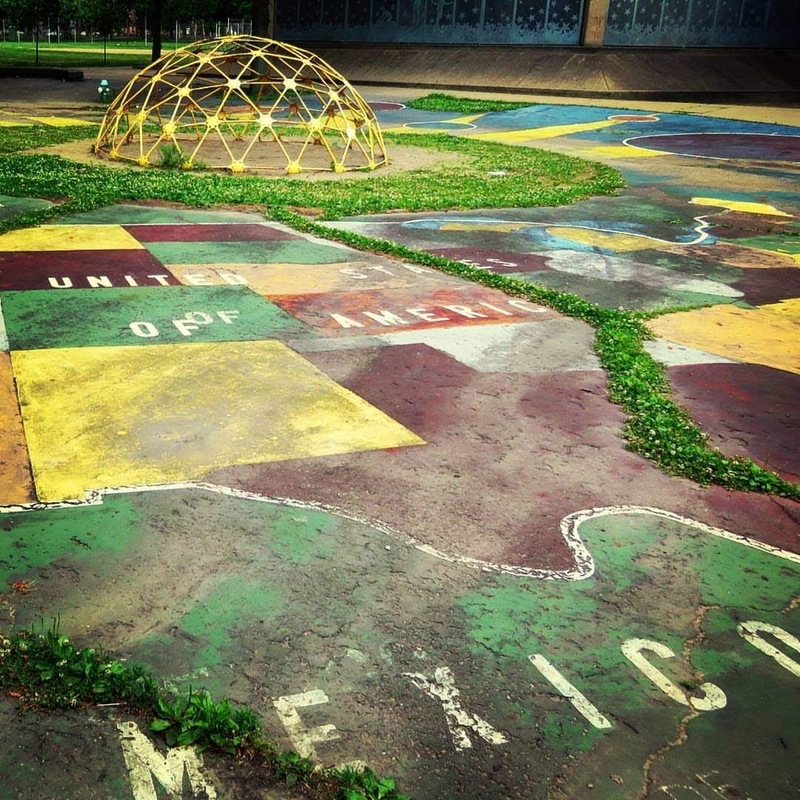 You can't beat the rich history and beauty of the Mexian War Streets for a Pittsburgh photowalk. Visit the Mexican War Streets neighborhood of Pittsburgh.Take a Mexican War Streets Walking tour. 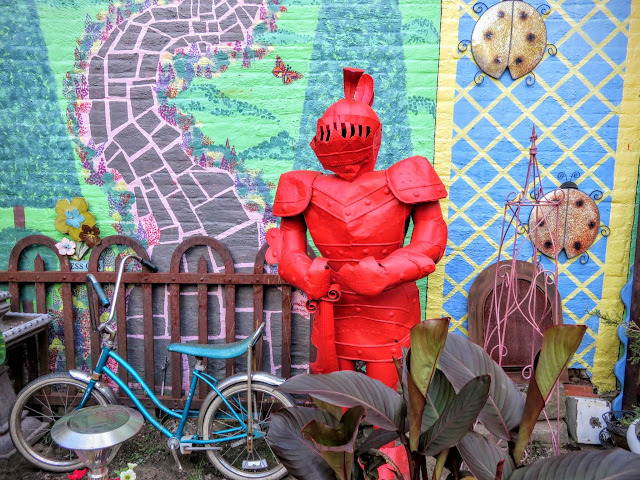 Check out Randyland.